Can we talk chocolate for a moment, because not only is Asheville known as Foodtopia, but it’s also Chocolatopia as far as we’re concerned. Early this month, we perused three chocolatier shops in Asheville: French Broad Chocolate Lounge, Chocolate Gems and Chocolate Fetish. Nom nom nom. Chocolate Gems: We fell in love with Chocolate Gems when they were located on State Street in the heart of downtown Black Mountain. It was so fun to finally get to check out their Asheville location, which has all their wonderful chocolates and gelato, just in a much bigger space! 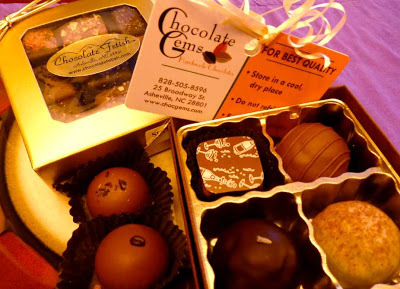 Out of all their divine handmade truffles, our favorites continue to be the lavender truffle and the peanut butter truffle. They also had a tasty champagne truffle that we couldn’t pass up! And don’t forget to order up some of their made-from-scratch gelato. It’s the real deal. wine and an essence of roses then enrobed in a flavorful dark chocolate couverture.” We also got a large variety pack of their salted caramels and it lasted about a day, so it’s safe to say they’re fabulous. Note that each chocolatier offers online ordering, but we suggest a visit in person when you stay with us at the Inn on Mill Creek! And keep in mind, in addition to the chocolate oasis that is Asheville, the town of Black Mountain near the Inn can also satisfy your chocolate craving with Black Mountain Chocolate and Kilwin’s. This entry was posted in Uncategorized and tagged Asheville, food and drink, shopping by Inn on Mill Creek. Bookmark the permalink.